Omega Yeast provides high quality, pitch-ready yeast for the beer industry and homebrewers alike! Their packs contain about 150 billion viable cells at packaging; 50% more than other liquid yeast suppliers. That's enough yeast to fully and completely ferment a 5 gallon batch of beer with an original gravity up to 1.060. 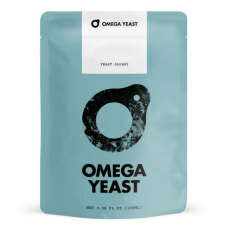 Optimized for consistent performance, Omega yeast offers a selection of traditional yeast strains, as well as a range of proprietary strains developed in-house and a selection of rare strains. You will be surprised at the fermenting performance and quality of products offered by Omega Yeast! An evolving blend of nearly every Brett strain in Omega Yeast Labs' collection! Coast to Coast! A blend that utilizes a saison strain from the northeast U.S. and a Brettanomyces strain from the northwest U.S., American Farmhouse makes excellent farmhouse ales! A blend of Saccharomyces and a number of Brett strains that produce a complex, fruity and funky beer, from Omega Yeast Labs! A blend of Brett brux and faux-brett strains that produce a dry beer with classic funk-forward brett character, from Omega Yeast Labs! A blend of Brett and faux-Brett strains that produce a dry beer with some fruitiness and just a touch of funk, from Omega Yeast Labs! A strain of Saccharomyces yeast once thought to be Brett, Tropical IPA is a fruity strain perfect for a range of IPAs, from Omega Yeast Labs! A traditional lager strain from Munich, Bayern Lager yeast from Omega Yeast Labs ferments clean and crips through a wide temperature range! A unique Norweigan kveik strain that presents a ton of tropical notes and can accentuate fruit-forward hops and beers, from Omega Yeast Labs! A fruity, hazy yeast strain with purported east coast origins that accentuates hops, from Omega Labs Yeast!